How to Use the New Google Keyword Planner Tool Accurately? With the recent replacement of the popular keyword tool with the new keyword planner, webmasters and internet marketers were more than eager to try out this new version for carrying out keyword research. But, to everyone's surprise the new tool has been integrated with the adwords account thereby needing a login before anyone can start using the keyword planner. 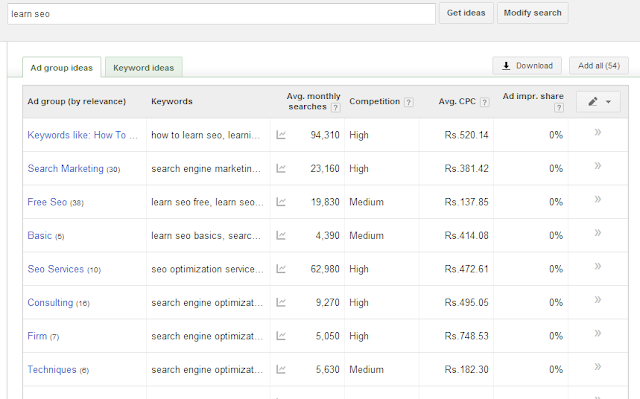 The modern keyword planner tool will look a lot confusing in the first use with no choice of local search volume data. But, there are many welcoming replacements that were done in order to improve the efficiency of the overall research. Let's take a deep look in the modern era version of the historic keyword tool. The first requirement is to register yourself as an adwords user before you can have a glimpse of it. Don't worry, it's not that tough and you won't be charged for this. This is absolutely free. After you have signed up and logged in, move to the keyword planner located under tools and analysis. Choose the first option if you want to individually enter the keywords to see their performance, search volume data, competition and average CPC. If you are already having a predefined set of keywords, then go for the second option. Suppose, you are having two separate lists that can be merged together to get keyword ideas then click on the third option. In a majority of cases, the first option is what you will choose so we will move ahead keeping the individual search in mind. Ad group ideas - This column displays the relevant keywords sorted under various categories/groups. Each group will contain similar keywords that is relevant to the main group title. What's good is, it will show a combined average monthly search volume of all the individual keywords contained in the ad group. Keyword ideas - This column will display the individual keyword search volume as it used to display in the old interface. The data displays the average number of times people have searched for the exact keyword over a period of 12 months based on the targeted settings (explained ahead). The competition column lets you see the overall competition for the particular keyword on a metric of high, medium and low. The CPC column lets you see the average cost per click based on the targeted settings and the overall bids. The Ad impression share column displays the total number of impressions received as compared to the last calendar month. You may refine the research data with the help of the targeting column. The targeting interface lets you choose a specific location (even a particular city), specific language, targeted database (Google or search partners) or exclude negative keywords. This is particularly helpful in making your search campaign locally relevant and allows you to get targeted leads that leads to more conversions. 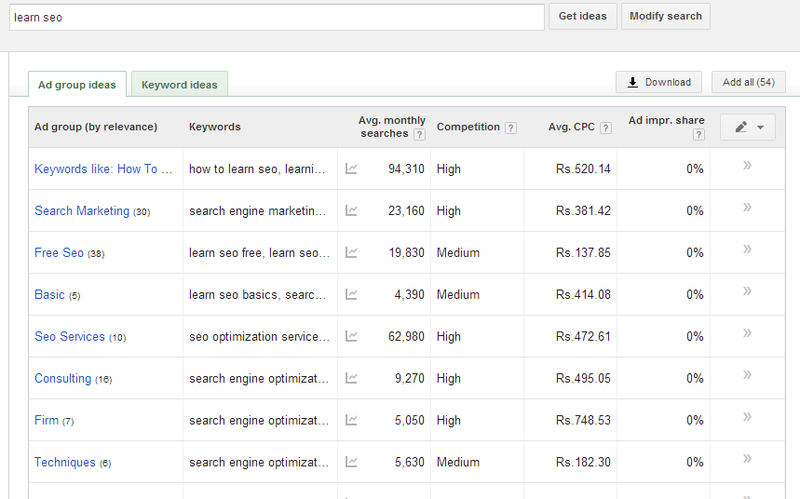 You can customize your search by adding keyword filters based on average monthly searches, CPC or impressions. This option is particularly useful in doing research related to adult keywords. You need to change the keyword options settings to let Google display the adult related keywords under the keyword ideas. You may choose to include or to exclude certain keywords by using this option. You can see the broad match, exact match and the phrase match options located inside the pencil icon at the right most column of the research interface. But do not get confused with this, it does not changes the average search volumes of the selected keywords to exact, broad or phrase match but instead it only affects the click and cost estimates. The average search volume has an exact match criteria by default. Have you tried the keyword planner tool yet? Share your comments below.